The Lenovo ideacentre 710 has reliability and performance wrapped up. Equipped with premium anodized aluminum paneling and rubber-touch coating, as well as an easy-carry handle for convenient mobility, this desktop is easily accessible for expanding storage and other components. What's more, with a built-in, fast-performing Intel Core i-processor, it guarantees excellence from multimedia streaming to video editing and beyond. Premium performance, powerful possibilities. With stunning visuals and performance, the new Intel Core processor family delivers processing power that takes your computing to the next level so that you can work smarter. 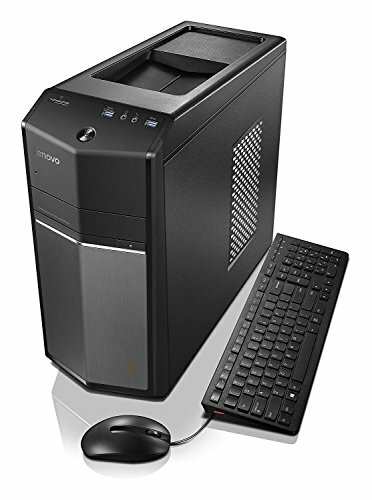 The Lenovo ideacentre 710 desktop comes guaranteed for performance in a quality package. It's equipped with premium anodized aluminum paneling and rubber-touch coating, as well as an easy-carry handle for convenient mobility. This desktop is simple, stylish and highly accessible. Equipped with NVIDIA GeForce GTX discrete graphics, the ideacentre 710 comes prepared for incredible entertainment and big gaming performance. The ideacentre 710 comes with plenty of storage space. What's more, with expansion of up to 32 GB of memory, there's no task this powerful desktop can't handle with ease. Dimensions 18.1" x 16.2" x 6.9"
LATEST INTEL CORE PROCESSORS: Premium performance, powerful possibilities. With stunning visuals and performance, the new Intel Core processor family delivers processing power that takes your computing to the next level so that you can work smarter. DISCRETE NVIDIA GRAPHICS: Equipped with NVIDIA GeForce GTX discrete graphics with 2GB dedicated, the ideacentre 710 comes prepared for incredible entertainment and big gaming performance. QUALITY DESKTOP DESIGN: The Lenovo ideacentre 710 desktop comes guaranteed for performance in a quality package. It's equipped with premium anodized aluminum paneling and rubber-touch coating, as well as an easy-carry handle for convenient mobility. This desktop is simple, stylish and highly accessible. EASY EXPANDABILITY: Thanks to a tool-free design, you can install additional components or expand your hard drive further seamlessly and easily, without even the need for a screwdriver. What's more, with expansion of up to 32 GB of memory, there's no task this powerful desktop can't handle with ease.